This Basic Math software curriculum is perfect to learn math, re-learn, review and prepare for Proficiency Exams and Achievement Tests. Use as Grade 5 math software through adult math software - it is appropriate across all age groups who need to learn these basic math skills. Even younger elementary math students in Grade 3 or Grade 4 will be able to learn from the early sections in each program... they will "grow" into the more advanced topics as their math skills mature. These basic math software programs are for middle school math students as well as adults returning to the basics of mathematics. 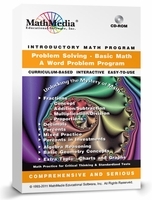 Each basic math skills program offers interactive math problems with solutions and explanations. In these math computer programs math help is always a click away. Basic math skills assessments are scored and stored electronically for teacher to retrieve and use as progress reports. Tests for all five (5) basic math software programs are included. These tests are scored and stored by the computer for evaluation of progress -- A valuable tool for the middle school math teacher as well as those facilitating the learning of adult math students. After taking the test, a personalized score sheet is printed along with an evaluation of topics requiring further study. The student can then return to the body of the program and practice more math problems in those sections which were weak areas. The use of the tests is flexible -- the student may take Test A as a pre-test and Test B as a post-test or Test A may be used for one student and Test B for another. Learning math for the adult math student can be challenging. 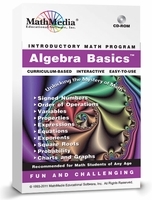 This basic math software series has been used successfully by college support services and college tutoring centers for many years. The math in these programs is delivered in a serious, yet kind and gentle manner so that the adult math student can learn without the distraction of cartoons and flying objects. Math help is presented in a clear and concise manner and is available from each question. Learn math in a calm, self-paced manner with good instructional technology. Since data collection continues to be an important issue, the Windows version of the "Basic Math Series" provides you with a "Learning Management System" (LMS). The LMS automatically tracks students' test scores and provides the teacher with a database (.csv file) to sort and print as needed. Basic math skills competencies are recorded for analysis and to direct the student to those sections of the program which require more practice. Purchase titles individually for $49 each or the set of 5 for $159.